Public speaking is only one part of the Toastmaster International experience. There is also a leadership component to Toastmasters International and some of us have found being on the club, area and district executive councils to be a wonderful part of our personal Toastmaster experience. At First Oakville Toastmasters we’re looking for a Sgt.-At-Arms for the new season. The Sgt.-At-Arms role is both an important role but it’s also a fairly easy way to get involved in service and leadership. Here’s how it works. Anyone who is elected Sgt.-At-Arms gets recognition for their efforts by Toastmasters International through the Competent Leadership program. Training is provided by the district executive and best of all, if you even complete six months of the year, you get the credit as does the other person who takes the other six months. While it’s great if the Sgt.-At-Arms can be at every meeting, it’s not essential. That’s why our club created the role of Corporal-At-Arms to help the Sgt.-At-Arms when they are unable to attend a meeting. Other club members can be pressed into service as well so if you’re considering the Sgt.-At-Arms role don’t be overly concerned about having to attend every meeting. Again it’s nice but not essential. The duties of the Sgt.-At-Arms are listed in the Sgt.-At-Arms manual provided to every new Sgt.-At-Arms by Toastmasters International. Put really simply the role involves hanging the club banner, seeing that water and glasses are placed by the hotel staff at every seat, the name tent cards are out and that’s about it. At First Oakville we do a few other things such as setup the banner in the hotel lobby on club night but that’s not essential to the smooth running of the club. The Sgt.-At-Arms moves the lectern for the speakers and helps gather the voting slips and organizes the counting of votes and provides the chair with results. At the end of the night the Sgt.-At-Arms takes down the banner and goes home. On contest nights the Sgt.-At-Arms assists the contest chair and on election night they help out as well. Being voted in as Sgt-At-Arms is an honour. I was Sgt.-At-Arms for one season at another club and I loved the experience. 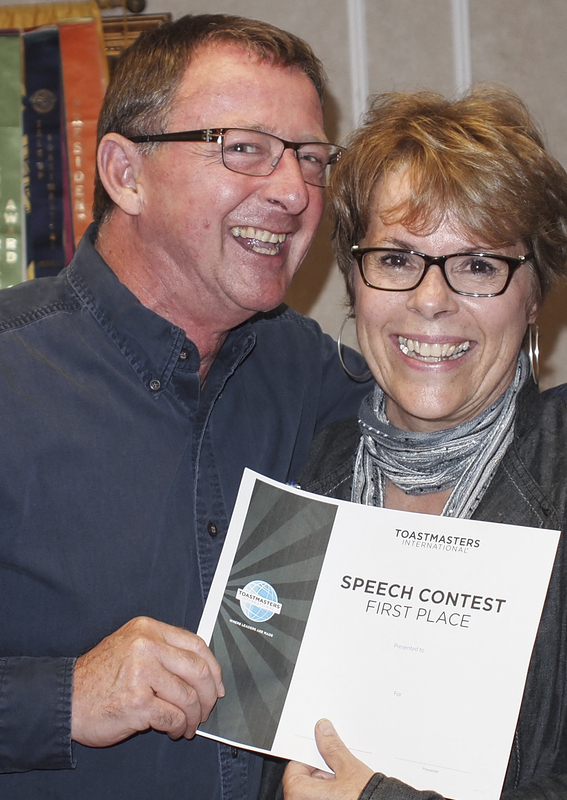 It was contest night at First Oakville Toastmasters last night (Thurs. Sept. 20) and the room at the Quality Inn on Bronte Road was packed. 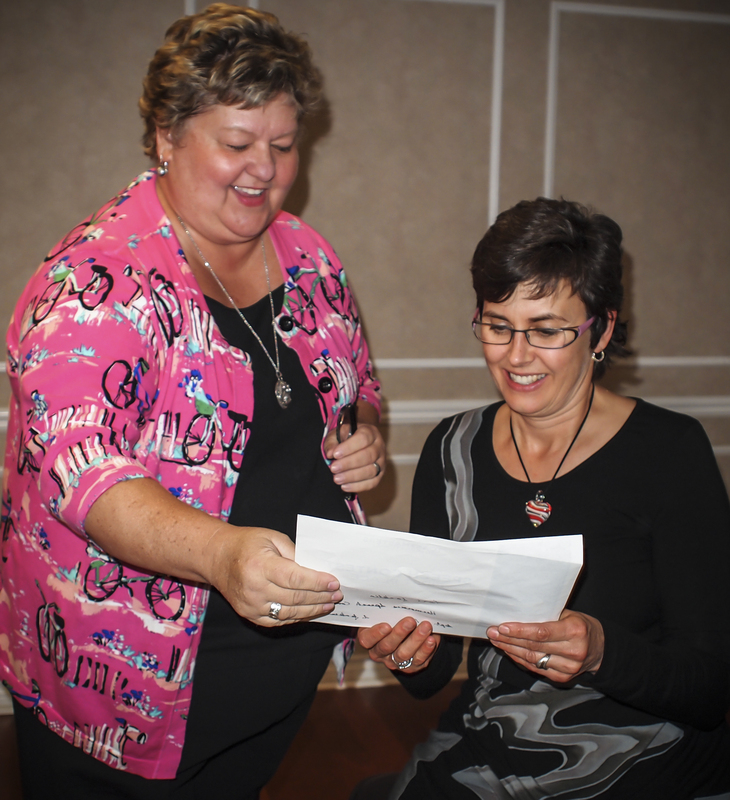 Humorous contest was first off and with four contestants (Teri Jacklin, Thersa Yust, Heather Cunningham and Loreen Paterick) only first and second place are announced. Humorous is not an easy contest if you’re not funny and that’s what keeps a lot of us old-timers from stepping in so last night we had a relative newcomer take first place. Congratulations goes to Teri Jacklin whose talk about the exploits of her elderly neighbour Bob and her own husband Mike had the room rocking. Heather Cunningham took second place with her equally funny talk about the “new cottage”! After the break we had nine Toastmasters try their hand at Table Topics. This is a great contest for newcomers to throw their hat into the contesting ring. Last night three winners were announced with third place going to Eleanore Hayward[ second to Val Clements and first to Peter West. Congratulations to all with Teri and Peter moving forward to represent First Oakville at the Area Contest October 10. Now why did it work? Simple. It was the delivery. 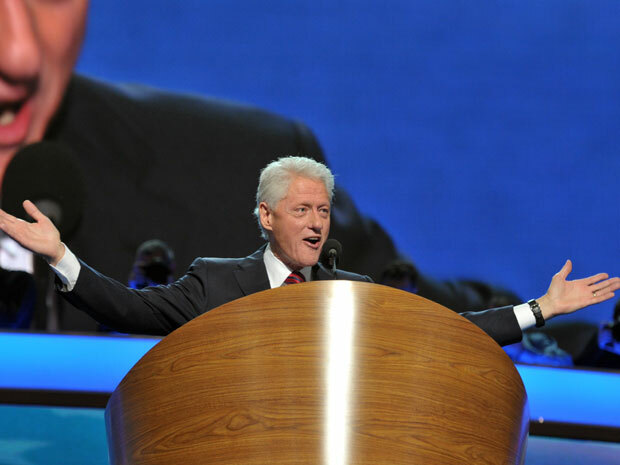 Bill Clinton can deliver a speech. He’s a speaker who can read from the phonebook and get a standing ovation. Bill was having a good time up at the lectern and in return his audience was having at least as good a time listening to him. He ad libbed. He laughed at his own jokes. The audience loved him. So what did Bill do right? Finally and perhaps most importantly Bill Clinton ended with a call to action and the action was to wait for the change that was coming. A great American speech? No. But a great American speaker? Absolutely. And a speech and speaker who can teach us all how to deliver a big speech.